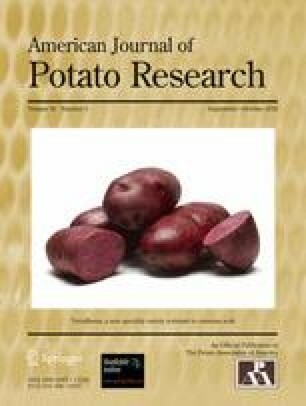 Fourteen potato lines, including some indicating reduced susceptibility to zebra chip (ZC), were assessed in trials over three seasons at Pukekohe (New Zealand) under three insecticide regimes: FULL (pre-plant plus 14–15 foliar applications through the season), REDUCED (4–5 foliar applications) and NIL (no insecticide). In all three seasons there were consistent reductions in tuber yield, dry matter and tuber size from the FULL to the REDUCED to the NIL insecticide treatment. ZC severity recorded in crisp slices before and after frying tended to be highest in the NIL treatment and lowest in the FULL treatment. All lines had symptoms of ZC in both raw and fried crisp samples but there were clear differences between lines, with some showing significantly fewer symptoms of ZC than current widely grown potato lines in New Zealand. The potential of these ZC-symptom tolerant lines, both as parents in a breeding programme and for possible release, is discussed. CLso titre of individual tubers of three lines was also determined from the 2014 NIL plots using qPCR. There was little relationship between CLso titres and ZC scores in either raw or fried crisp slices both within and between lines. Se evaluaron 14 líneas de papa, incluyendo algunas que indicaron susceptibilidad reducida a la papa rayada (ZC, por sus siglas en inglés), en ensayos durante tres ciclos de cultivo en Pukekohe (Nueva Zelanda), bajo tres regímenes de insecticidas: COMPLETO (previo a la siembra más 14–15 aplicaciones foliares a lo largo del ciclo), REDUCIDO (4–5 aplicaciones foliares) y NULO (sin insecticidas). En los tres ciclos hubo reducciones consistentes en rendimiento de tubérculo, peso seco y tamaño de tubérculo, desde el tratamiento con insecticida COMPLETO, al REDUCIDO, al NULO. La severidad de ZC registrada en rebanadas crujientes antes y después del freído tendieron a ser las más altas en el tratamiento NULO y las más bajas en el COMPLETO. Todas las líneas tuvieron síntomas de ZC, tanto en muestras crudas como en fritas, pero hubo claras diferencias entre líneas, con algunas mostrando significativamente menos síntomas de ZC que las líneas ampliamente cultivadas ahora en Nueva Zelanda. Se discute el potencial de estas líneas tolerantes a los síntomas de ZC, tanto como progenitores en un programa de mejoramiento o como posibles liberaciones. También se determinó el título de CLso de tubérculos individuales de tres líneas de los lotes del tratamiento NULO de 2014 usando PCRq. Hubo poca relación entre los títulos de CLso y los valores de ZC en rebanadas crudas y fritas, tanto dentro como entre líneas. We wish to thank Carolyn Edwards and Moe Jeram for their technical support in both the field and laboratory, and Robin Gardner-Gee and Steve Lewthwaite for their advice and support. We also wish to thank Jessica Dohmen-Vereijssen and Gail Timmerman-Vaughan for suggesting improvements to the paper. This work was largely funded by The New Zealand Institute for Plant & Food Research Limited/Potatoes New Zealand joint potato breeding programme. Department of Primary Industries and Regional Development. 2017. Tomato Potato Psyllid. https://www.agric.wa.gov.au/tpp. (accessed 26 April 2017). Kale, A. 2011. Report on the economic and business impacts of the potato psyllid on the potato industry. http://www.potatoesnz.co.nz/users/Image/Downloads/PDFs/Potato%20Economic%20survey%20Report%20Jun%202011_V2.pdf (accessed 1 March 2011).